NEPEAN, NICHOLAS, army officer and colonial administrator; baptized 9 Nov. 1757 in Saltash, England, youngest of three sons of Nicholas Nepean and Margaret Jones; m. 21 April 1784 Johanna Francisca Carolina Wedikind in Stoke Damerel (Plymouth), England, and they had at least three sons; d. 18 Dec. 1823 in Newton Abbot, England. Nicholas Nepean began his military career on 15 Dec. 1776 as a second lieutenant in the Royal Marines. After service afloat and in New South Wales (Australia), Gibraltar, and Britain he became a brigadier-general in 1804. On 17 March 1807 he was appointed administrator of Cape Breton, a position he probably owed to the fact that he was the brother of Sir Evan Nepean, who had held various posts in the British government. Nepean’s career had not prepared him for the challenges in Cape Breton. The colony did not have a house of assembly, and hence had limped along without locally raised revenue until John Despard’s term as administrator. In 1801 Despard had inaugurated a tax on imported rum, of doubtful legality, in order to provide for even the simplest amenities. However, the money had gone to help settle the vanguard of the great Scottish migration to Cape Breton, which began in 1801. The resulting increase in population added fuel to the arguments of Richard Collier Bernard DesBarres Marshall Gibbons, son of a former chief justice, for an assembly. Then there were the coal mines, a potentially lucrative source of revenue which the meagre resources of public and private enterprise had failed to develop effectively. An added handicap for Nepean was his personality. When he arrived in Sydney on 2 July 1807, he could not be persuaded by Despard to discuss the colony’s situation. Despard declared that Nepean was “as I am informed by several who know him well a remarkably indolent Man, and unfortunately for himself too easily imposed upon by artful and designing Men.” Despard’s ill feeling may have been reciprocated, since from the outset Nepean seemed to gravitate towards his predecessor’s enemies such as William Campbell and Gibbons. He first fell under the influence of Campbell, reappointing him mines superintendent. However, Campbell was not regarded with much favour in Whitehall and in April 1808 Nepean was ordered to cancel his appointment. Before long Gibbons acquired influence over the administrator, and Nepean named him acting attorney general when he broke with Campbell in the summer of 1808. Nepean also replaced a number of Despard’s nominees in the Executive Council. When word of these seemingly arbitrary dismissals reached London, anger flared. 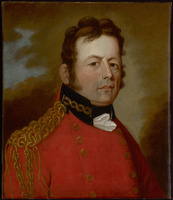 Sir Evan Nepean tried to defend Nicholas by describing the Cape Bretoners as a “troublesome, turbulent set of people,” but could not prevent his being warned in April 1809 to mend his ways or suffer dismissal. Nepean reacted characteristically, reinstating a few officials. He retained Gibbons as his chief confidant, even though Gibbons had continued to call for an assembly, an institution Nepean considered “dangerous.” In December 1810, however, Gibbons frightened Nepean when he persuaded the grand jury to petition for an assembly. Nepean dismissed him, but was swayed enough by his arguments to bring the matter before the council, which promptly opposed an assembly. By the spring of 1812 Nepean seems to have come around to Gibbons’s way of thinking, and appointed him to the council. Nepean then suspended the rum tax and asked the council to approve the calling of an assembly. Such was Gibbons’s influence that this time his ideas were accepted. In order to strengthen his hand with the British authorities, Nepean allowed Gibbons to propose that a poll be taken of the colonists’ views on an assembly. The emergency created by the outbreak of the war with the United States in June and the consequent need for immediate revenue persuaded Nepean to forgo the poll and write in October to Lord Bathurst, the newly appointed colonial secretary, justifying the need for an assembly. However, Bathurst had already decided to replace Nepean by Hugh Swayne*, who arrived in Sydney on New Year’s Day 1813. It was Nepean’s fate to leave other problems unsettled. Though the Napoleonic Wars and the American Embargo Act of 1807 had resulted in increased economic activity in Nova Scotia and New Brunswick, they affected Cape Breton only indirectly. Her ships were too small to take part in the growing transatlantic and Caribbean trade that the larger colonies enjoyed, but she could ship her goods to those provinces and participate in the economic growth of the region. However, increased trade meant increased inflation: for example, between 1807 and 1808 the price of flour went up by 100 per cent. To stop this trend Nepean allowed the importation of American food-stuffs and forbad the export of food or cattle, but prices continued to rise. Moreover, the attraction of prosperity in Halifax and Saint John and the growing demand for sailors drew away miners, many of whom had been Newfoundland fishermen. Inflation and a scarcity of labour drove up miners’ wages and also production costs, and in 1808 John Corbett Ritchie, the mines superintendent, asked that the price of a chaldron of coal be raised from 16 to 20 shillings. Nepean had also to face the poor state of the mines, which were still suffering from Campbell’s mismanagement. Production was lagging just when the increasing number of troops in Halifax had created a demand for coal. To solve the problems of high wages and low production, Nepean put 30 of the New Brunswick Fencibles stationed in Sydney to work in the mines. The output of coal rose until the summer of 1811, when Lieutenant-General Sir George Prevost*, the lieutenant governor of Nova Scotia, ordered the troops to stop working, perhaps because he hoped to open the Pictou coalfields in his own colony. In frustration, Nepean leased the mines to the Halifax merchants Jonathan and John Tremain, but allowed the lease to expire after they asked for an increase in the price of coal. Negotiations were proceeding with another merchant when Nepean’s term ended. Nepean does not appear to have been employed after his return to England. While in Cape Breton he was promoted major-general, and on 4 June 1814 he became a lieutenant-general. Nicholas Nepean’s previous career and personality did not equip him to tackle the economic and political problems of Cape Breton. He failed to deal effectively with political questions and vacillated when faced by opposing forces. His lack of experience with economics prevented him from coping with the long-range development of the island. On the other hand, rising inflation, economic competition from Nova Scotia, and the growing movement for an assembly were beyond his control, and indicated that a change in the colony’s situation was necessary. PAC, RG 8, I (C ser. ), 366: 133–37. PANS, RG 1, 58, doc.88. PRO, CO 217/125: 76–77, 95, 97–98, 171–73, 178–79; 217/126: 16–20, 25–27, 34–36; 217/127: 5–6, 14; 217/128: 35; 217/ 129: 37–38; 217/130: 30–36; CO 220/15: 6–7, 103–4, 136, 142–45, 150–51, 172–73. ADB. Burke’s peerage (1893), 1024. The royal military calendar, containing the service of every general officer in the British army, from the date of their first commission . . . , ed. John Philippart (3v., London, 1815-), 1: 285–86. R. J. Morgan, “NEPEAN, NICHOLAS,” in Dictionary of Canadian Biography, vol. 6, University of Toronto/Université Laval, 2003–, accessed April 24, 2019, http://www.biographi.ca/en/bio/nepean_nicholas_6E.html.